Entries for the 2018 North Downs Run are NOW OPEN. In 2018 The North Downs Run will again host the British Masters Multi-Terrain Championship. This entry was posted in Uncategorised on 9th October 2017 by isteadandifield. 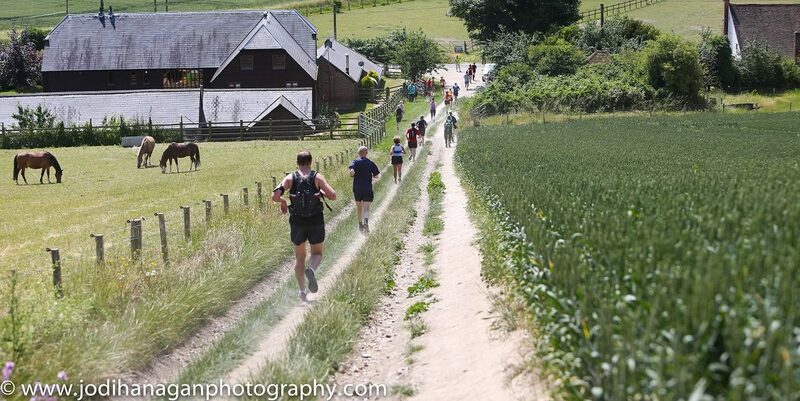 North Downs Run Results – Click on the link. Thank you for all the marshalls, water station volunteers, cake bakers, helpers, and the NDR committee who were out there today. We couldn’t have done it without you. Congratulations if you have completed the race, and we hope you enjoyed it. This entry was posted in Uncategorised on 24th June 2017 by isteadandifield. Just over a week to go until the North Downs Run. Entries are still open through Run Britain and Runners World. Keep up to date on our Facebook Page and Twitter (@NDR30K). If you are available to marshall or can help out in anyway by baking a cake or cutting back the course, please email us on northdowns@outlook.com . Download a copy of the Runners Guide here. Find out more on our North Downs Run Page. This entry was posted in Uncategorised on 16th June 2017 by isteadandifield. So here we are, the final race report of the Grand Prix. Well as we normally start in the winter months, with the Cyclopark 10k. This time the January 5th addition. David Sancto was the first home in a time of 43:02, followed by Janet Murray in 52.04, Lee Marsh 54:21, Jason Beaney 55:07 and last in, in just under the hour was Fay Oram in 59:01. Kevin Denny opted for the 5k finishing in 26:59. We then had a big break until the 23rd Jan when it was the Canterbury 10, David Sancto was once again our first finisher in 1:09:09 which is 32 second improvement on his Thanet 10 result 6 weeks earlier. Helen Fooks & Jason Beaney were also down at Canterbury both finishing in a time of 1:33:48, not sure who was pacing who, or was it just a training run? Then on the 29 Jan Jan Giles (Allan) was down at the Romsey 5 finishing in a time of 58:27 and winning her age category once again. And that’s it for January. However February was a bit busier. Once again we started with Cyclopark Jane Copeman & Francesca Lear completed the 5k finishing in times of 28:13 & 33:28 respectively. Once again David Sancto was the 1st Istead finisher, this month in a time of 43:48, followed by Jaks King (Paul Bunch) in 45:46, Janet Murray 51:37 (improving by about 20 seconds on her Jan time) Lee Marsh 51:42, Helen Fooks57:07 & Fay Oram 58:40. Then on the Sunday 5th it was the London Winter Run, don’t know too much about it, but seemed to involve Penguins and Polar Bears, our 3 finishers were Amanda Graham 55:53, Jane Copeman 57:42 & Fay Oram 1:11:42 (running with a friend). Maybe one of them can tell us a bit more about the race, the Polar Bears and what it was in aid of? The following weekend saw one of Dan’s favourite races of the year, the Vigo Valentine Run, we packed well at the front with 5 finishers in the top 15. Allowing us to scope the Men’s team prize. Finishers were Ross Chapman 3, Dan Walsh 8, Mark Simmonds 9, Andrew Archer 12, Carl Gardner 13 (running 2nd claim for Istead), Nick Claydon 42, John Gillis 65 and our sole women racer Amanda Graham in 96th. (unless I’ve missed you Louise Chapman?). Sunday the 19th had Richard Storr running 43:35 at the Tenterden 5 and Chris Gregory running 1:48:21 at the Tunbridge Wells Half. Which takes us up to the final weekend of the GP for this year, and we have athletes at 5 different races. We had 4 runners at the Headcorn Half. First in was Paul Jones in 1:18:50 a good time and he’s looking good for the London Marathon again. Next in was Janet Murray who bagged herself a big PB posting 1:55:38, Kevin Denny 1:58:19 (Janet & Kevin are also both building up to the London Marathon) & then Jan Giles (Allan) in 2:47:20. Then leaving the best until last Trevor Edgley won a British Masters Silver Medal @ the Masters 10 Mile Road Champs up in Cumbria during pretty filthy weather, Well Done Trevor !!! So what does this mean for the Grand Prix? Well if you come to the AGM in March, with your Subs in hand, all will be revealed…. This entry was posted in Uncategorised on 2nd March 2017 by isteadandifield. in December we had 50 performances, but not that many races so this report is not too long. As is becoming customary the month started with the Cyclopark Floodlit Series, but this month David Sancto wasn’t the first Istead finisher, in this case it was Jaks King in a time of 45:04, but David Sancto was there and this month he was pacing Steve Ball (welcome back Steve) to a very respectable 46:45. Janet Murray just nipped under 50… mins, and this time she wasn’t missed off the results, followed by Fay Oram 56:51 and Jane Copeman who just sneaked under the hour 59:57. Then on Sunday it was “Down ta Marget” for the Thanet 10 and unseasonably mild conditions some good times where posted, I was 1st in 5th in a time of 61:55, Derek George was 9th with 63:39, David Sancto 69:41, Sarah Dand 73:48 (and 4th lady), Sandra Barbuti 1:36:35 and Jan Giles just nipping under 2 hours in 1:59:18. The following two Sundays had two of the largest Istead turnouts of the year, for on the 11th we had 20 runners at the Turkey Run, I won’t go through all the results but Ross Chapman was first in 6th place in an outfit that once seen can never be forgotten. The following Sunday saw 18 Istead athletes at the Cyclopark Xmas Cracker, once again I won’t go through all the results but Istead did kind of clean up with the Prizes as Ed Bovingdon won the 10k in a time of 34:04, Simon Parrin won the 5k in 19:33 and also in the 5k Lynne Champion won the womens race in 20:19 (and came 3rd over all). And that’s it for Dec 16. But I do have a few earlier missed events to bring everyone up to speed on. Going back the 5th June Susan Holland completed the Dorking 10 in a time of 1:36:55, on the 18th Sept Nick Claydon completed the Hursley 10k (I have no idea where that it) and on the 29th Oct we had 4 runners down at the Beachy Head Marathon, Ross Chapman 1st in 22nd place a time of 3:27, next in it was good to see Ray Raymond Pearce racing and finishing in a time of 3:52, next in was Louise Chapman 4:43 and finally Sally Dawodu in 5:45. And now the section you’ve all been waiting for, the Simon Parrin update!!! Unbeknowst to me Simon Parrin has been pretty active racing this year, but many of his races have been a bit off the beaten track so I’ve previously missed them. But after some detective work I think I’ve now found them all, so here goes. and finally on the 28th Aug he won the Oliver Fisher 5k. Simon please let me know if I’ve missed anything else. So that’s us fully update on the race reports and later in the week I’ll update the Dec Grand Prix position. This entry was posted in Uncategorised on 16th January 2017 by isteadandifield.